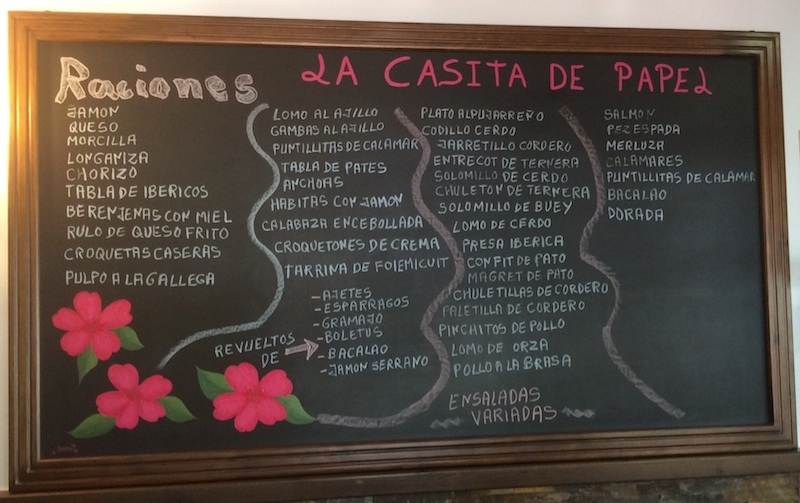 After visiting Lanjarón’s honey museum we stopped off at La Casita de Papel for lunch. We’re glad we did as it’s a nice spot and the food was good. S opted for the menu del día (€10 including drink) and had a delicious soup of lentils, chorizo and smoked ham. For the main, grilled fish and for dessert a cute custard flan with toffee sauce. 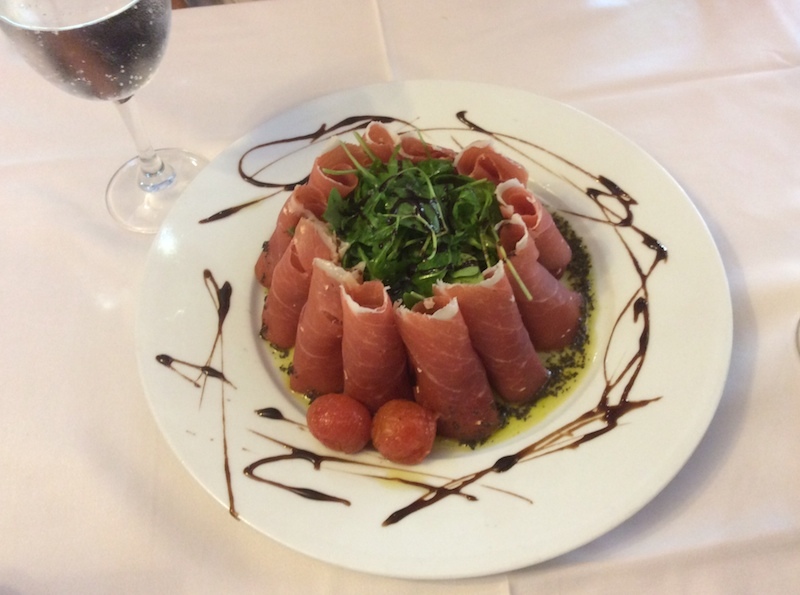 M settled for el capricho de jamón (€10) – curiously called ‘The Whim of Ham’ – basically rolls of jamón surrounding a stack of peppery rocket, olives and olive oil. It was very good. We couldn’t resist a couple of plump croquetas made authentically with béchamel sauce with a crispy coat. In truth, these we a little bland. Looking at the chalk board and menu suggests there’s a massive choice; from grilled fish and seafood to pasta dishes and salads.. Most of the main dishes and salads are between €10-€12. It’s a good place if there’s a group of you or if you have children as it’s away from the main road and next to a play area. There’s a fountain too where you can fill your bottles with pure Lanjarón water. There’s also plenty of parking. Bang on 2pm the place filled up. 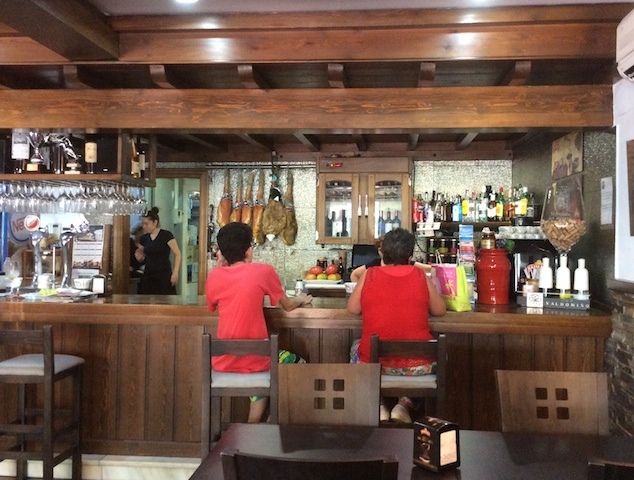 There are three main areas: outside (too hot when we went), inside by the bar and a separate dining area. There are cotton tablecloths (for a place that does a €10 lunch menu, that’s good), clean loos, attentive staff – and the terrace and restaurant are accessible if you’re a wheelchair-user. Recommended and another place to add to the list of decent local eateries. How to find it: From the main road it’s easy to miss. As you exit Lanjarón westwards on the way to Granada there’s a straight stretch of road with colourful fitness equipment on the right. Just after this, there’s a children’s playground. The restaurant is behind this. It’s a 10 to 15 minute walk from the main bus stop by the roundabout. La Casita de Papel is open from 9am to late, every day except Wednesday. I have a bit of a love-hate relationship with croquetas. Most places just toss a bag of industrially-produced, deep-frozen ones in the fryer. They have the consistency of cat-sick in leather casing. But when they are properly home-made, they can be fantastic. That was the odd thing – we’re pretty certain they were homemade (as was everything we ate) but they weren’t that tasty. Texture was great though.